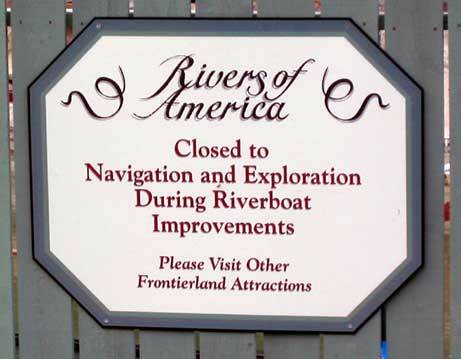 During Spring 2003, Disneyland is performing an extensive refurbishment of the Rivers of America and the related attractions, including Tom Sawyer's Island, the Mark Twain Riverboat, and the Sailing Ship Columbia. For the first time in several years, the river itself has been drained of water. The following pages include photographs showing this refurbishment, taken from various public areas inside the park. Some of the vantage points used include the balcony at the Disney Gallery in New Orleans Square, the upper levels of Tarzan's Treehouse, as well as a number of locations on the ground along the river. Some of the photos from March 16th do show water in the river as a result of heavy rain from the day before.